This is an art blog where I will be adding new drawings and paintings of Hula girls and Tiki Gods every week, sometimes more, along with related videos, Hawaiiana and tons of Tiki trivia. So crack open a cold one and enjoy the show. LONO IS ONE OF THE FOUR MAJOR GODS OF THE ANCIENT HAWAIIANS. LONO, THE POLYNESIAN GOD OF PEACE AND PROSPERITY, FERTILITY, THE BRINGER OF RAINS, MUSIC AND AGRICULTURE. THE ANNUAL FESTIVAL, "MAKHIKI" IS HELD IN HIS HONOR. DURING THIS TIME, OCTOBER THROUGH FEBRUARY WAR, AND UNNECESSARY WORK IS KAPU ( FORBIDDEN ). Help support this site by buying an art print! 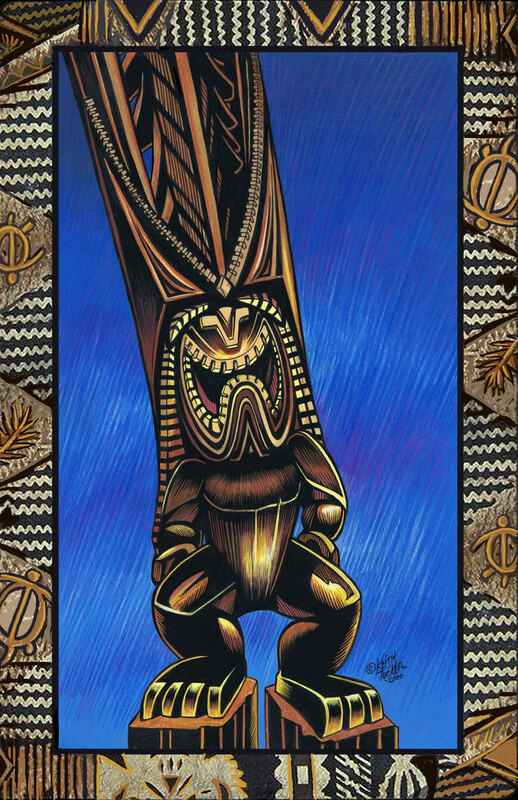 Twenty years of living and creating art in Hawaii has driven me to reflect on the "Polynesian Pop Culture" also known as, "Tiki Culture". It first came to America in the 1930s, and it is a unique offshoot that is inspired in part by Tiki carvings and mythology of the Polynesian and South Pacific islands, though the connection is loose and stylistic. The Tiki rode a wave of popularity in the late 1950s and early 1960s marked by the entrance of Hawaii as the 50th state in 1959 and the introduction of Tiki hut bars and restaurants around the continental United States. Then the mid 1990s saw the beginning of a revival of the Tiki culture, and it's still going strong. This Tiki's just Gotta Dance. Say Aloha to Summer, Fall is here.